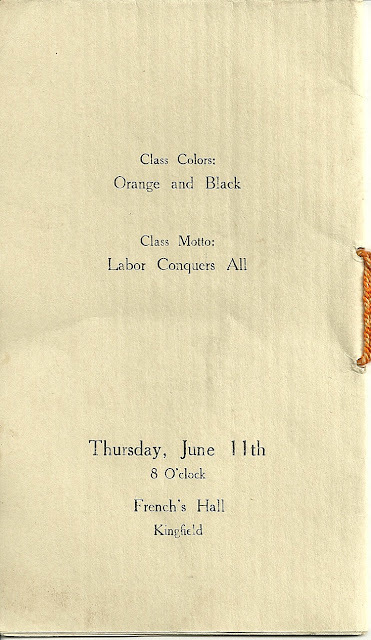 Class of 1914 graduation program of what I assume is Kingfield High School, as the event was held at French's Hall in Kingfield, Maine. Nelson Guy Barden was born 7 September 1895 [though his WWI draft registration shows 7 September 1896] at Madrid, Maine, the son of Charles Carr Barden and wife Mary Ada (Wing) Barden. In 1918 at Phillips, Maine, he married Eva Gladys Thomas, who was born 29 July 1898 at Kingfield, Maine, the daughter of Leon A. Thomas and wife Mary Edith Stevens. Nelson Guy Barden was working as a druggist in Massachusetts, per the 1930 Census. The couple had at least three children. Nelson died in 1978. 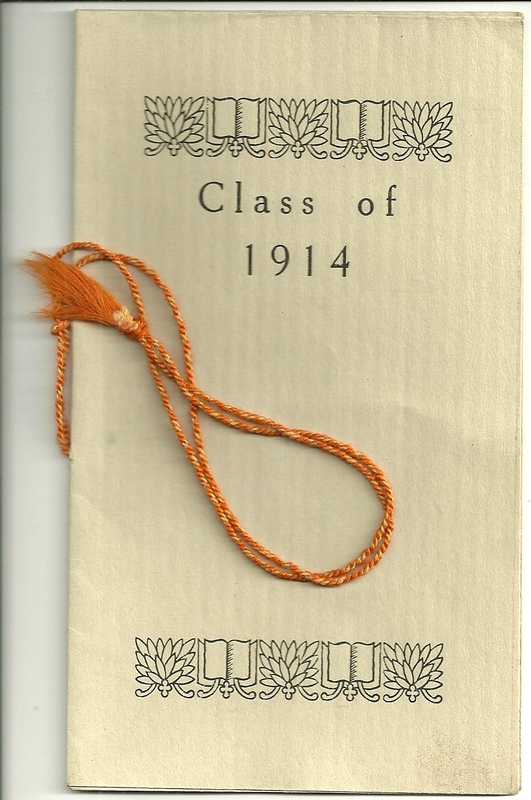 Sadly, graduate Donald William Norton, a 2nd Lieutenant, was killed 4 years after graduation, on 2 November 1918, near the close of World War I and was buried at the Meuse-Argonne American Cemetery at Romagne, France. He was born 15 March 1896 in Maine, the son of Lavella Augustus Norton and Imogene F. (Parker) Norton. His paternal grandparents were Tristram and Amanda Harriet (Durrell) Norton. His maternal grandparents were Joseph Newell Parker and Sarah Josephine (Boyinton) Parker. Hortense Lucille Savage was born 7 December 1894 at Kingfield, Maine, the daughter of Ellery Turner Savage and wife Lucretia Pullen (Vose) Savage. Her paternal grandparents were Isaac G. and Selina (Moore) Savage. Her maternal grandparents were Warren and Matilda Knapp (Pullen) Vose. In 1915 at Kingfield, Hortense married Blaine Elbridge Atwood, who was born 30 August 1884 at Concord, Maine, the son of Manley George Atwood and wife Addie Frances (Moulton) Atwood. I found one child for them, a daughter. Hortense Lucille (Savage) Atwood died in 1926. Hazel May Weymouth was born 15 November 1895 at Freeman Plantation, Maine, the daughter of Fred Clyde Wemouth and wife Mary Elizabeth (Fuller) Weymouth. Her paternal grandparents were Moses and Sarah T. (Lander) Weymouth. Her maternal grandparents were Samuel Rutillus Fuller and wife Mary Ellen (Pike) Fuller. In 1917 at Lewiston, Maine, Hazel married William Harold Hutchins, who was born 11 Jan 1891 at Fowler, New York, the son of Rev. Richard Baxter Hutchins and his first wife, Flora Amelia (Gibbs) Hutchins, who died when William Harold was about two. His father was a Maine native but was a minister at Fowler, New York for a time. William Harold Hutchins's paternal grandparents were Richard and Eliza (Mitchell) Hutchins. I haven't yet found information on the parents of his mother, Flora Amelia (Gibbs) Hutchins. Hazel and William Harold Hutchins had at least three children. I found them in the 1930 Census of Kingfield, Maine. Hazel May (Weymouth) Hutchins died in 1978. 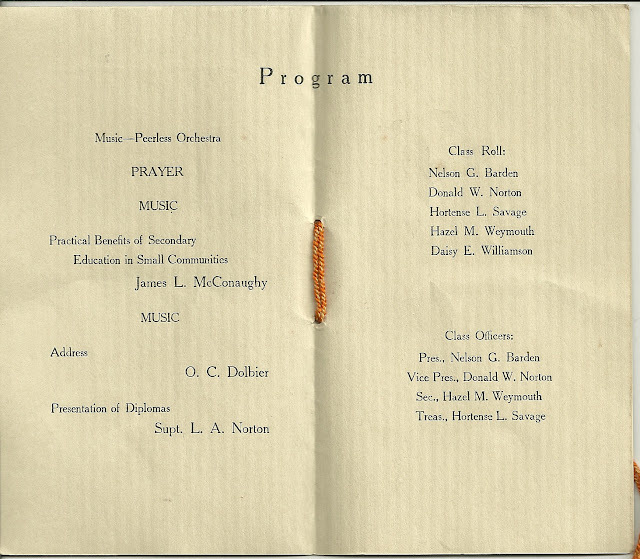 Daisy E. Williamson was born 11 June 1895 at New Portland, Maine, the daughter of Samuel Johnson Williamson and wife Effie Annie (Pierce) Williamson. Her paternal grandparents were Sullivan and Nancy Danielson (Lane) Williamson. Her maternal grandparents were George Washington Pierce and his wife Mary E. (Hopkins) Pierce. Daisy married Swedish immigrant Gust Conrad Agren, the son of Gust Fred Agren and Katherine L. (Olson) Agren. Many records show Daisy's name as Daisy L. Williamson, with the L standing for Lizzie. Daisy and Gust Conrad Agren had at least five children and lived at New Portland, Maine. Daisy died in 1962.